Osmose Productions has in recent years set a new standard for black metal and their seemingly endless cycle of fascinate and blasphemous releases has me perpetually fascinated. This latest offering comes from Akrotheism a Greek black metal band who have built a morbid reputation around imperial black metal slaughter. 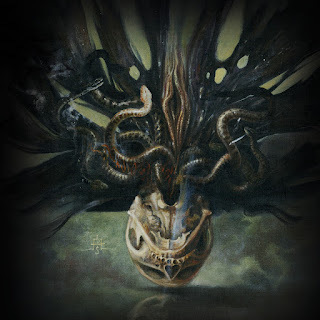 Focusing on orthodox satanism and the nihilism of the human condition, The Law Of Seven Deaths is a wonderfully bitter and twisted journey through aural decadence. With an utterly massive guitar tone, Akrotheism prove time and time again on this release that they are black metal masters. These purists unveil some sick and twisted riffage from the opening salvo and they continue to defile all the way through the very experimental closing track, En. The band has seemingly only leaped from peak to peak here, this album is intense and borderline terrifying. It traffics in the burly and authoritative riffage that makes Greek black metal so good in the first place. At times over the top, but very aware of its sense of in your face blasphemy, The Law Of Seven Deaths is a sonic maze you can't pull yourself out of. Crafting vast atmospheres and conjuring dark imagery with monumental bellows and demonic songwriting, this is truly the soundtrack to the apocalypse. The deeper I dig into The Law Of Seven Deaths the more dark truths about Dante-esque landscapes seems to show itself. This is a record that revels in the murk and enjoys its own nihilistic beauty. It's hard not to get drawn into the inverted majesty of Akrotheism and in fact the more that I spend time within this space the more I realize, this is the true black metal.